Though it may not seem like it to the layperson, vending technology has progressed a lot in recent years. 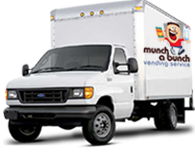 At Munch A Bunch Vending, we take every advantage of the latest technologies to provide the highest level of service to our customers. We’re incorporating a new app technology that helps us serve you better, while providing you with more convenience when needing service. The MR-1 app is a web-based program that lets you quickly and easily contact us in the event of a problem. Simply scan the QR code on the offending machine and directly report the issue. No more having to rely on catching the route driver when he’s in the office, or bothering the facility manager with refund requests. One of the technologies our machines feature is Sure Vend. This is a guaranteed product delivery feature that utilizes infrared beams to tell if a purchased product drops or not. If not, refunds are provided immediately. Bill recyclers further enhance convenience. Instead of returning tons of dollar coins when big bills are used to purchase items, these machines can return paper bills as change. Technology doesn’t only positively affect the end-user customer, but also helps us do our jobs better. For instance, many of the machines incorporate wireless technologies that allow us to see machine inventories remotely. This lets us more efficiently serve customers, while also bringing exactly what each customer needs for their machines. It’s also a great tool for evaluating item popularity. Other new features found on our machines provide a greener vending experience. Energy Star machines are more efficient and incorporate LED lighting, reducing their carbon footprint and the amount of money it takes to run them.